As China rises, what sort of challenge will it pose to the U.S.-led status quo? 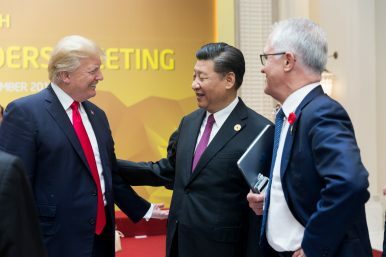 China most definitely has a ready narrative for global leadership, and appears willing to extravagantly demonstrate its readiness for a leadership role. It’s worth remembering that the idea of global leadership isn’t entirely new to the PRC; China claimed a global leadership role early in the Cold War, only to abandon it in the wake of Mao’s death. But while Mao’s approach was revolutionary, predicated upon the destruction of an inherently corrupt order, the modern Chinese approach appears more reformist and incremental in nature. So what is liberal international order? In its most restrictive sense, it requires some kind of commitment to open trade. A more expansive conceptions stresses multilateralism over unilateralism and bilateralism, and pursues cooperative attempts to address global commons problems, such as piracy and climate change. At its broadest, it entails baking a preference for liberal rights and democratic institutions into international order. In a general sense, the American post-war order has combined aspects of all three. Of course, it would be a mistake to overstate the consistency of this order; even during the Cold War, the nature of the liberal order shifted from the embedded liberalism (free markets with broad latitude for state management) up until the 1970s to a system that de-emphasized direct state intervention (described by some as neoliberalism). The liberal international order also managed to endure a variety of economic and political shocks, accommodating itself to different political realities. Change, in other words, is not new. What is new is the potentially dominant role played by an openly illiberal state, which brings into open question the “liberal” component of the liberal international order. It seems quite likely that China will attempt to maintain the legalistic international economic system, while refraining from pursuit of its political counterpart. There should be no doubt that China will have a strong interest in maintaining some kind of legalized economic order, or managing the existing order in ways that benefit Beijing. The question of intellectual property brings this into stark relief. Much like the United States, an underdeveloped China sought to acquire as much technology as possible from more advanced foreign economies. And much like the United States, as domestic industries became more internationally competitive, intellectual property law has become more rigorous. There is no doubt that Chinese corporations with strong export profiles will soon demand that Beijing protect their property abroad, and little doubt that China will establish and support multilateral means of ensuring this protection. Thus, Beijing has the profile and interests of a state that will attempt to establish an international order, and there is every reason to believe that this order will be at least a loosely legalized one, built upon modifications of the existing order. Notably, even under Xi Jinping, China has NOT taken steps to disrupt the core tenets of the liberal international order. It has not conducted disruptive interventions of the politics of foreign countries (as has Russia), nor rejected norms against territorial conquest (as has Russia). China has chipped away at the margins, but these chips look very much more like a reformist effort than either a revolutionary restructuring of the international order, or a preference for watching the world burn.